Many great thinkers have perceived the essential role of conflict and competition in human development. The famous British historian Arnold Toynbee described the advance of civilizations as a continuous process of challenge and response. Sri Aurobindo has explained how life presents exactly those conditions which are required for human beings to discover their hidden potentials and evolve spiritually. This process often takes the form of a conflict between the individual and society or between established social norms that are receding and new ideas and values that are emerging. 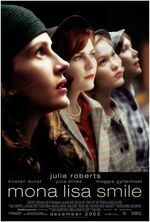 The film realistically depicts the process of social development, described in Theory of Social Development, with regard to the transition of American women from social character to social individuality. It brings into clear focus the role of the pioneering individual in breaking new grounds, the organized opposition and resistance of the conservative orthodoxy, which view the progress as a retrograde step, the factors leading to a change in attitude, and early stages of imitation as the new behavior acquires greater social approval. 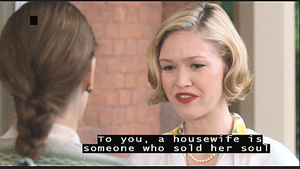 This process is beautifully portrayed in Mona Lisa Smile. The film is about Katherine Watson, a college lecturer from liberal-minded California, who manages to get a teaching position in the Art History Department at Wellesley, a prestigious, conservative, and elite private women's college situated at the opposite end of the country in Massachusetts. The girls who attend Wellesley are drawn from some of the most wealthy, influential, and upper class families in America. Massachusetts is a conservative place where the upper class strives to preserve their distinctive superior position, and Wellesley is an institution dedicated to this cause. Girls were sent there to learn good grooming, traditional values, and respectable behavior deemed appropriate for a life in high society during the early 1950s. That was a time and place where it was still believed that the ideal path for respectable women was to get a good education to prepare them for marriage, tending a house, and raising a family. This was the aspiration of the girls who attended Wellesley. This is what their families wanted for them and this is what the college prepared them for. Then along came Katherine. She's from progressive California where class distinctions have lost importance, tradition is disregarded, and women aspire for freedom to think for themselves and act according to their own values rather than merely conform to a traditional role as dependents. What made a liberal young Californian to seek employment at a stodgy old college and what prompted the conservative college to employ her? Perhaps it illustrates the principle that we are subconsciously attracted to our opposites because they present us with the best opportunities for self-discovery and personal growth. Certainly, that proved to be the case for Katherine and the college. In almost every way, Katherine and Wellesley rubbed each other the wrong way. The college insisted that she should strictly adhere to the lesson plan and textbook, which the students were adept at memorizing; whereas, Katherine wanted to provoke the students to think for themselves and arrive at their own judgements of things. The college insisted that social interaction between men and women should maintain ‘proper' appearances, even when actual behavior was far from ideal. Katherine disdained false appearances and insisted on the freedom to express what she really thought and felt without concealment. The students startled Katherine by their high intelligent and rude snobbery in dealing with one who was not drawn from their class. Katherine startled the students by challenging their mindless conformity to the traditional role of woman as dependent housewife and their refusal to seek careers in which they could fully develop and express their intellectual talents. One student named Betty, whose influential and dominating mother was the head of the alumni association, chose the traditional ideal of an early marriage to a respectable man. Betty was appalled by the values and attitudes which Katherine exemplified and openly stirred up opposition to Katherine among the students, parents, and college administration. Katherine was equally appalled by Betty's thoughtless conformity and tried to convince other students that they need not follow the same path. Ultimately, Betty became disillusioned with woman's traditional role when she discovered that her husband was having an affair and her mother urged her to silently endure it in order to maintain proper appearances. Finally, she broke away from her mother's dominating influence, sought divorce and moved to New York City to start a career. Like many of us, Betty's path to progress involved the pain of rude awakenings and disillusioned dreams. In retrospect, her staunch opposition to Katherine concealed a subconscious urge for her own progress. In spite of Wellesley's strict rules of behaviour and profession of high moral standards, Katherine discovered that people's conduct was far from admirable. Bill Dunbar, an Italian professor, had affairs with several of his own students and fabricated a story about fighting in World War II in order to impress Katherine and gain her affection. The college nurse was fired after 20 years of service for providing contraceptives to girls who asked for them. 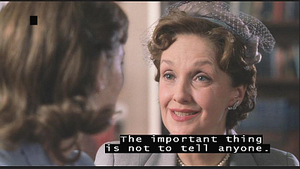 The college president, succumbing to pressure from Betty's mother to ensure continued financial support from the wealthy alumni, wrote to Katherine that her term of employment would be extended only if she accepted the most rigorous constraints on her freedom as a teacher and an individual. The story depicts American society in a transition period in which women are casting off the shackles of their traditional role as socially dependent and intellectually inferior to men. Katherine represents the newly emerging values; Wellesley, the old that resist social change. Despite the apparent opposition, she manages to awaken her students to think for themselves and aspire beyond their traditional role. Her classes become so popular that they attract record enrolment for the following semester. Her students come to respect and adore her, even though they cannot fully accept her values or way of life. So successful is she in winning their hearts, that the college is compelled to extend her term of employment subject to strict conditions. Though she has a deep affection for the students and attraction for the challenge of changing those around her, ultimately she realizes that greater challenges and opportunities for growth lie elsewhere and she departs from Wellesley to pursue her process of self-discovery in Europe. Humanity is a work in progress, a transitional being. At one end we are still striving to rise above our animal origins dominated by physical needs and vital urges to become fully human beings characterized by civilized behaviour, cultured emotions, and a rational mentality. At the other end we aspire to rise above the limitations of the ignorant mind and selfish human ego to become more than human, to become spiritual and divine. In between there is a crucial stage in which each member of the collective who is defined, guided and dominated by the norms of society and the aspirations of the collective begins to emerge as a formed individual in our own right with the capacity to think for ourselves, see beyond the viewpoints of the collective, acquire higher attitudes, values and aspirations reflective of an inner urge for spiritual development. Katherine is a pioneer of this transition representing one stage in the emergence of modern woman from a socially dependent member of the collective to mentally awakened and psychologically developed individuality. Her story depicts the inner struggle and the outer conflicts associated with this emergence. She is not an idealized soul but a real human being, eager for social acceptance and approval as all of us are, but refusing to surrender her idealism in order to buy social approval. She was attracted to the old world of conformity by something within her that still seeks for the security of being like everyone else. Though she counsels her students to think for themselves, she tries to mold them in her own image as an endorsement and validation of the path she has chosen. When she finally realizes this and recognizes their right to proceed at their own pace on their chosen paths, she decides to move on. She has planted a seed and lit a fire in her students, which will smolder or burn according to the readiness of the tinder. Her own aspiration calls her to the fresher air of new pastures abroad. Katherine learned that difficulties are opportunities and all the challenges that life presents us contain seeds for our spiritual growth. We tend to seek out other people who think like we do and share the values we have accepted. But the soul within us is not satisfied with any limited formulation of truth or any limited development of our inner divine potentials, so it seeks out and invites life circumstances which present us with those truths that we deny or fail to perceive. For, we come from the One which is whole and undivided, we move toward the One which is all-inclusive, and our destiny is to discover the whole truth of the One, both in this world and beyond it. The story takes place at Wellesley College in New England during 1953, at a time when a conservative backlash led by Senator Joseph McCarthy, spreading fear and suspicion through America. The women's-only college is populated by extremely bright, snobbish upper class students who are being bred for traditional life as dutiful American housewives. Katherine Watson, a 30-year-old, unmarried, progressive, art history teacher from Oakland California is hired by Wellesley in spite of the fact that she lacks the ‘appropriate' family background, breeding, and education because the college needs a last minute replacement for the position. Coming from the liberal California, Katherine is clearly out of place at Wellesley. Katherine tries to open her students' minds to their freedom to do whatever they want with their lives. She encourages her students to believe in themselves, to study to become career professionals, and to improve their economic futures. She utilizes her art teachings as a vehicle to put across her opinion to the young women; that her students needn't conform to stereotypes of women made by society, or the roles made for them by society, as women born to become housewives and mothers. She felt that women could do more things in life than solely adopt the roles of wives and mothers. In one scene of the movie, she shows her students four ads, and asks them to question what the future will think of the idea that women are born into the roles of wives and mothers. Katherine's ideas and ways of teaching are contrary to methods deemed acceptable by the school's directors; conservative women who believe firmly that Katherine should not use her class to express her point of view or befriend students, and should stick only to teaching art. Katherine is warned that she could be fired if she continues to interact with students as she has been doing. 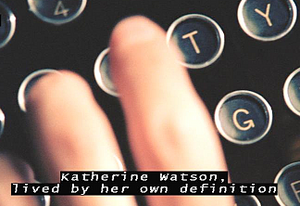 Undaunted, Katherine becomes stronger in her speeches about feminism and the future of women. She is a firm believer that the outlook of women in society needs to be changed if women are to achieve better futures, and that she needs to instill a spirit of change among her students. Watson chooses to leave after one-year but, as she is leaving the campus for the last time, her students run after her car, to show their affection and to thank for her lessons. Nancy Abbey: Housemate with Katherine. Homely and conventional, Nancy is a teacher of etiquette, who has told everyone that her husband died in the South Pacific during the war to cover her sense of shame that he has actually run off with another woman and raised a family. She is typical of the hypocrisy that insists on maintaining a false veneer of respectability to veil an inner emptiness and secrets. 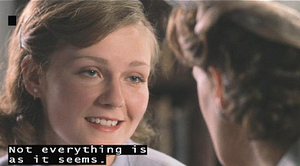 Amanda Armstrong: She is the school nurse and a lesbian whose female companion teacher died a few years earlier. She also boards in the same house as Katherine. Early in the story, Betty publishes an article revealing that Amanda has been giving free birth control devices to students who request it, resulting in her dismissal at the insistence of the alumni council, which is headed by Betty's mother. Bill Dunbar: Handsome Italian teacher who speaks often of his experiences fighting in Italy during the war. Katherine later learns that he never left the USA during the war and has never been to Europe. Elizabeth ‘Betty' Warren: Attractive, intelligent, snobbish epitome of the Wellesley girl. Her mother heads the Alumni council. She is married to Spenser earlier in the story. She is one who most fully embraces the traditional ‘American dream' of marriage and she leads the active resistance and opposition to Katherine until her dream collapses when she learns that Spenser is having an affair and her mother asks her to quietly accept the situation. She becomes a convert to Katherine's side. Joan Brandwyn: A close friend of Betty who embraces the same dream but less aggressively and insistently, she seeks to follow in Betty's footsteps by marrying Tom Donegal, a friend of Spenser's. 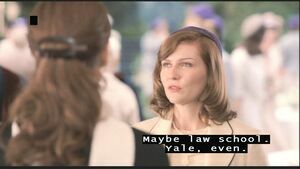 Katherine encourages her to apply to Yale law school, where she succeeds in getting admission, but she ultimately declines the offer in order to play the traditional role of housewife to Tom. Giselle Levy: Loose and liberal Jewish student who has an active affair with Bill Dunbar and later with a married middle-aged psychiatrist. Giselle is one who rejects conventional morality and refuses to hide what she thinks and does. Connie Baker: Shy and lacking confidence, she doubts whether any boy can be attracted to her. When Charlie Stewart begins taking her seriously, Betty incorrectly or intentionally tells Connie that Charlie is engaged to her own cousin and nearly ruins the relationship. Katherine is a woman with values and an aspiration to make a difference in the lives of her students. She obtained the position at Wellesley by pursuing the opening with single-minded determination. Determined energy accomplishes. Katherine refuses to board in the college staff quarters because of the rigid regulations that ban everything from hot plates to male visitors. The first day at Wellesley foreshadows the conflict of values that will plague her during the year and ultimately lead to her departure. During the first day in class the students taunt and humiliate Katherine by showing her that they already have mastered the contents of the entire textbook. They sense she is a challenge to their conventional values and seek to dominate her on her own subject. Katherine challenges the students by presenting them with unfamiliar modern art and asking them to think for themselves instead of spouting what they have read in the textbooks. The students respond to the challenge and lose their arrogant hostility. Amanda loses her job after attending Wellesley as a student for four years and then working there for 20 years. "Too much independence frightens them." As college newspaper columnist, Betty constantly attacks Katherine's liberalism - teaching Picasso! -- and stirs up the administration and alumni to temper Katherine's activities. When the confrontation reaches a climax and Katherine is ready to quit, she presents her students with advertising images of the stereotypes American housewife and challenges them to accept that this is all they are capable of or meant for in life. Paul Moore, Katherine's lover from California, shows up unannounced during the Christmas holidays, immediately presents Katherine with an engagement ring and wants to sleep with her. Though she is offered the respectability which people at Wellesley longed for and which she knew would make her more acceptable there, she declines it because her contact with the Wellesley dream has made her even more committed to pursue real development of her individuality. When she discovers that Bill has been lying about his wartime experience and confronts him with it, he accuses her of wanting everyone to be like her. 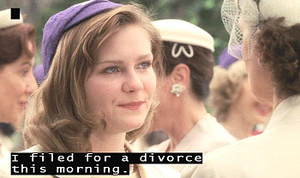 Finally, Betty files for divorce, decides to move into a Greenwich village apartment with her nemesis Giselle and tells Katherine that she may even apply to Yale law school. The fact that pre-enrollment for Katherine's next year's class in art history is the highest in school's history signifies that she has been successful in delivering her message and the movement she represents will continue, even in her absence. She has given expression to a subconscious aspiration of American womenhood. Wellesley offers to renew Katherine's contract on conditions that would negate all that she hopes to accomplish. They try to kill the pioneering initiative by accepting on their own terms.